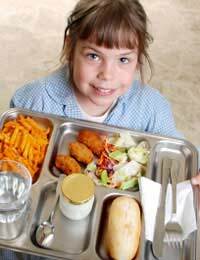 Home > School Meals > Is Your Child Entitled to Free School Meals? When your child begins full-time education the issue of what they will do at lunchtime is one that has to be looked at and considered. It is not always possible for a child to either return home for lunch or to be provided with a lunch of their own – either by giving them money or making them a packed lunch – so therefore one must consider free school meals as an option. Free school meals are provided in the United Kingdom where the local education authorities see fit. Although it is law that all children should be given the option of a free school meal, should their circumstances permit, not all local education authorities in conjunction with their respective councils can afford such a provision. Free school meals now only apply in England and Wales – again where provisions exist – but in Scotland this is something that is only allowed at the discretion of individual education departments. The first things to remember is that your local education authority is responsible by law to provide your child with free school meals should you fall into any of the categories – or criteria- that are required for them to do so. It is a given that any student in full time education is entitled to free school meals. Any student whose parents receive Child Tax Credit but do not recieve Working Tax Credit and whose annual family income is less than £16,190 as assessed by HM Revenue & Customs (2016 - these values are changed anually). Children who are being cared for by guardians who receive Pension Credit (under the ‘Guarantee Credit Element’). Nursery School children are only eligible for free school meals if they are being taught before and after the lunch break. Also students within sixth form education may be eligible given the relevant criteria but students undertaking further education are not eligible and therefore the provision of a lunch is at the discretion of the student and/or parent. Your local council or education authority will be able to provide you with further information on any special circumstances that they may perceive as being reasonable grounds for receiving free school meals. When you first apply for a place at a particular school for your child they will ask you – if the provision to do so is there – if your child wishes to take advantage of the free school meals system. If this is the case you will be required to fill out an application form or renewal of free school meals application form and also provide proof of your child’s eligibility. With this form you will be asked to provide the school with a copy of your Pension Guarantee Credit notice, proof of Income Based Job Seekers Allowance of Child Tax Credit. It is worth noting at this stage that if you do not – or cannot – provide the school with the relevant information, which they will forward on to the local education authority, your child will not be allowed to take free school meals and as a result you as the guardian or parent may incur a daily charge for a meal if your child wishes to have one in school. I've come off income support and now receive working tax credits but was entitled to free school meals for my child when will these stop and I have to pay for them? Can I cancel my child’s free school meal? And if so how? I live in England by the way. My son has started nursery in September however what I wanted to know was do people on JSA,child tax, ESA any Dwp benefit, do you still have to pay for nursery meals. The nurseries I have been too range from £5-15 a day even if it's 15hrs a week. @Vicky - if he was eligible before high school, he should be eligible at high school unless your financial circumstances have changed. Hi my son is going to high school in September, will he continue to receive free school meals? @Stacey - If your child doesn't have to be in nursery and you are receiving a free place, then you can't claim this back. The reason is that you don't 'need' your child to be in nursery over lunchtime (as you're not working), so this is your choice. The alternative is to place your child in nursery mornings or afternoons so you can feed your child at home (that's the government's take on it - if you see what I mean). So I get 15 hours free funding as I currently don’t work so I receive income support and child tax credits. I have to pay £18 a month just for nursery dinners anyone know if I can claim that back? You can see whether you may be eligible via the link here . Hiya. I am a single parent and a full time student nurse, I do not receive any tax credits but I do receive a NHS bursary to help with child care costs. My child is in year 3, is he eligible for free school meals? Please see gov.uk link here which should help you further. Hiya.. I am a single parent and a full time student nurse, I do not receive any tax credits but I do receive a NHS bursary to help with child care costs. My child is in year 3, is he eligible for free school meals? I have recently returned to work and am now aware that my child is no longer entitled to free school meals. Is this the case as of the day I return to work or is she eligible for free school meals for the rest of the term/year? Also, do I need to inform anyone of this change to cancel the free school meals? Thanks. My partner works 24 hours a week are my children entitled to free school meals or not? My daughter is 13 years old. I am on benefits so my daughter should be entitled to free school meals, however money for her meal is still deducted from my parent pay account. I don't understand this. I now receive Working Tax credit as working for only 24 hours a week due to my hours being cut and have been told that ANY PERSON HAVING ANY WTC even if it is a penny and you have savings/income UNDER £16.00 Will Not receive ANY help with free school meals,so if you are married and only work 24 hours a week this government will simply say NO and get lost. My son name jan rojas at in secondary 10 F I renew my son free meal last year sept 2016 until now im still waiting for nothing any letter from your office no answer at all ,my son still waiting i'm receiving tax child benefits and low income pls! help me to find out why ???? You can check whether you are eligible via the gov.uk site here. I hope this helps. You can check with your local council to see if your child qualifies for free school meals. You find out how to apply via the gov.uk link here. Hi, my child will be full time at nursery in a few weeks and I have been told I will have to pay for her school meals as I do not receive income support. My partners income is less than 16,000 so I'm not too sure how this will work for us?